See how Aerodyne‘s Ground-Plate (GPC) Cyclone high-efficiency dust collector and Vacu-Valve trickle valve system demonstrate how industrial dust collection works in a mining application. The Aerodyne GPC Cyclone Dust Collector represents an improvement over conventional high-efficiency cyclones. Unlike conventional cyclones, the GPC Dust Collector does not require a long, tapered body for effective dust separation. The unique design provides a high-efficiency, compact unit that is available in horizontal or vertical configurations. This compact cyclone dust collector is ideal for plants and workshops with limited floor space or limited overhead clearance. 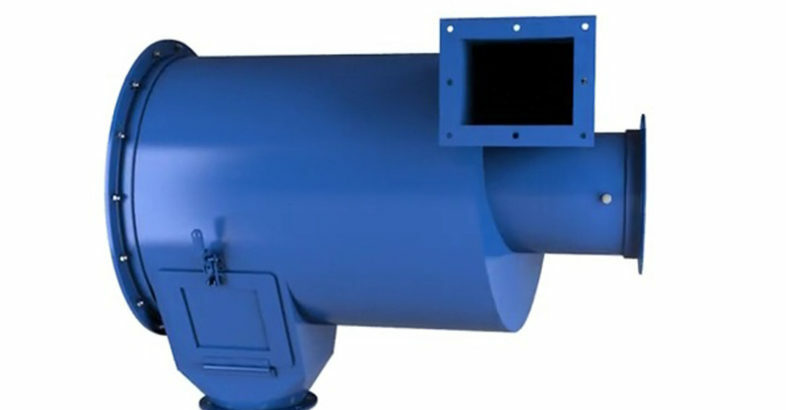 The Aerodyne GPC Dust Collector operates differently. A sloped spiral inlet directs the dirty gas stream toward a fixed ground plate and hopper of the dust collector. The ground plate forces vortex reversal to occur in a much shorter space, eliminating the need for a long, tapered body. As the dirty gas stream strikes the convex ground plate, fine particulate that has not completely made it to the dust collector walls is deflected into the hopper. The ground plate also shields collected particulate from the forces of the vortex reversal, acting as a barrier between the separation chamber and the collection hopper. This innovative design enables a compact dust collector to operate at high efficiency, even when installed horizontally.